US chip maker Marvell has launched a new chipset that it expects to revolutionise the home networking industry. 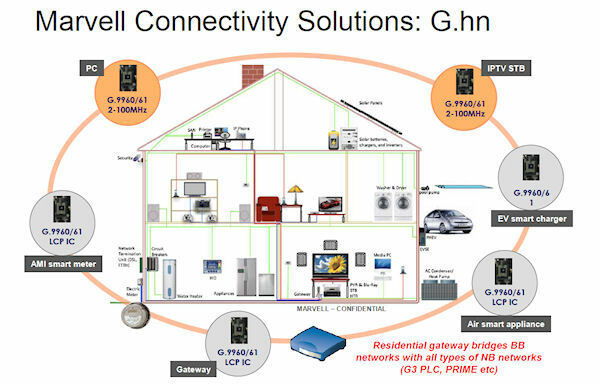 The G.hn transceiver chipset uses the G.hn standard, which allows one chip to control networking over not just power lines, but phone lines and coaxial cables too. In theory this means consumer electronics manufacturers only need to buy one chip for all their wired networking needs - hence making home networking more commonplace. On top of that, Marvell claims this chipset offers improvements in both bandwidth and reliability across all three types of wire. 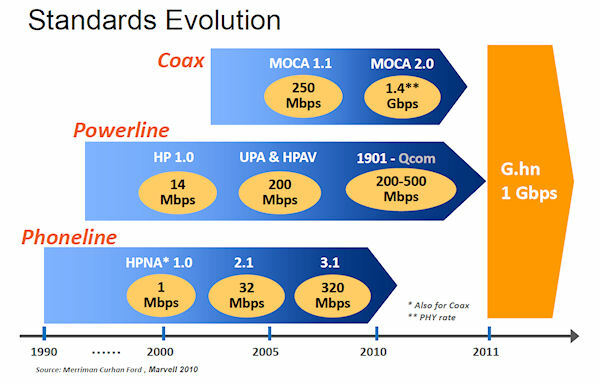 "This is not just a powerline standard, it's a unification of the wired networking industry," said Marvell's Ramon Garcia in an interview with HEXUS. "It's much better than all the legacy, proprietary standards." Garcia said a big reason home networking has not taken off in the mainstream is fragmentation among the standards. Not only does that make the whole process confusion for end-users, it also adds to the expense and hassle for manufacturers. The utopian ideal is that all appliances, such as TVs, PCs, phones, DVD players, etc, come with this chip built-in and thus are automatically networked as soon as they're plugged in. The explosion in digital content and cloud storage are major demand drivers for this kind of technology, as people are starting to expect instant access to their content regardless of which device they're using. "We consider this to be an inflection point - 100 percent," said Garcia. The two slides below summarise the G.hn proposition. Marvell also has a dedicated part of its website for people wanting to know more, and is a member of the HomeGrid Forum, where all things G.hn are discussed. I think more property developers should include ethernet wiring in the basic spec of new builds and even refurbs. I once lived in a house with two ports in every room, connected to a switch and router with ups under the stairs. Suffice to say the guy who refurbed the place worked in networking! It was brilliant though. A great selling point for modern folk!